Although lasagna gardening sounds like it should involve pasta with delicious layers of cheese sprouting from the ground, it’s actually a permaculture concept to build soil. By layering cardboard (to block weeds), fresh organic materials, compost, and soil additives like lime, the gardener mimics the forest floor’s natural decomposition process. The pile is supposed to be a few feet high, with most of it consisting of fresh organic materials like straw. You place all of it straight over existing grass, so you don’t even need to turn the soil. In an ideal situation, the gardener lays down these many layers in the fall and then plants into a glorious bed of fresh soil in the spring. But like all things in nature, the process never quite turns out as humans expect it to. I attempted lasagna composting last fall. As the point is to recycle resources that would otherwise be wasted, I attempted to use “found” materials we already had around. I pulled layer upon layer of cardboard boxes from the basement, stripping them of bits of tape. I took the hay bale displayed on our front steps as a Halloween decoration and broke it up. 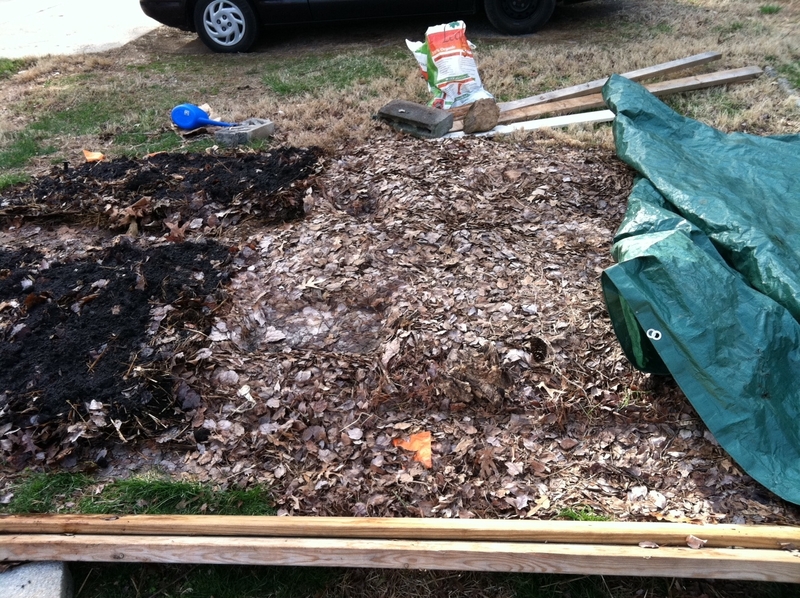 I hauled the mostly composted organic matter from our tumbling composter. 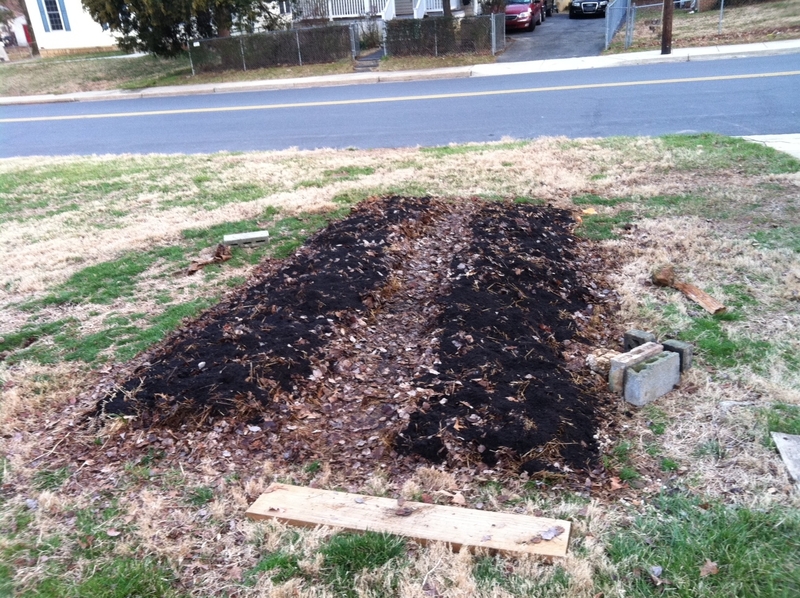 I also put down a couple of bags of LeafGro, composted material from Montgomery County’s organic waste collected. (Purchased, but very local.) I ripped pages from newspapers and laid them down in even layers. And then I scrambled around frantically as the wind blew half of my materials away. To prevent my materials from disrespecting the graves in the cemetery next door, I stuck more cardboard on top and weighed it down with a hodgepodge of boards and stones. Unfortunately, this set-up wasn’t pleasing to the Neighborhood Taste Police. We had not one, but two different calls from the town, complaining that our yard looked cluttered and haphazard. Admittedly, because our house is on a corner, the garden area is very visible from the road. But as I had spent hours putting all of the materials together, I was a bit annoyed. However, as irritating my neighbors wasn’t on the top of my list of Things to Do, I covered it all with garden fabric. Later on, I was able to finish off the whole rigmarole by raking all of the leaves in our yard together and piling them on top. Unfortunately, by that point, my garden fabric was horribly tattered from the gusty winter wind. 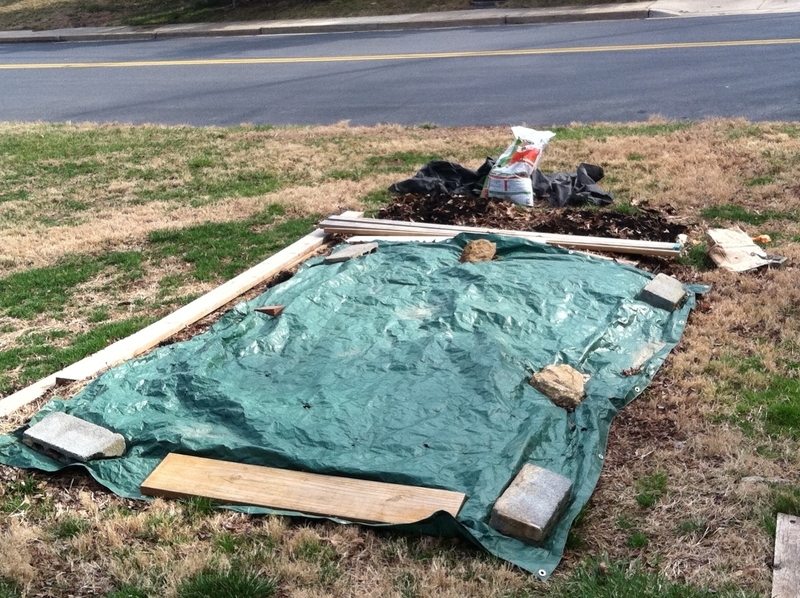 I replaced it with a tarp and weighed it down with concrete blocks my neighbor donated to the effort. Then, I waited…and waited. During the course of the winter, I would peek under the tarp to see if anything looked broken down. Unfortunately, it still just looked like a pile of leaves to me. A few weeks ago, when the weather started to break, I decided it was time to take decisive action. When I purchased the seeding equipment from the garden store, I also bought several bags more of LeafGro. Planting straight into a pile of leaves didn’t seem like ideal growing conditions. When I finally lifted both tarps off, it was exactly what I had expected: a pile of leaves. It didn’t look like much of anything had broken down. Hmmm....just leaves. No soil. Sad. Nonetheless, I had to do something. So I started digging out a pathway through the middle of the garden. When I had originally layered the materials, I had forgotten to do one. As I dug through, I became more and more relieved. It was like a geological exploration, in that nothing seemed to be going on at the surface, but there was plenty of change in the layers. As I dug through the cardboard, I saw that much of the straw had broken down and that the LeafGro was now loamy. Even though the leaves on top were mostly dry, the ones in the middle were partly decomposed. So not all was lost. Once I had moved the organic layers that had been in the middle to the sides, I covered the sides with another layer of LeafGro, just so there was something soil-like on top. After watering it, the layer had the added bonus of keeping the leaves from blowing away. The final product, ready for planting. 1) Layers of organic matter do not just magically transform into soil over the winter. Sounds obvious, but the books really make it sound like it does. Perhaps if I used spoiled straw (straw that’s been used as animal bedding), it would, but I don’t just have that sort of stuff lying around. I had leaves – lots of leaves. I’m not sure how to solve this problem, except perhaps lower my expectations. 2) Nonetheless, I’m really glad that I did lasagna gardening. As we went to dig up some spots outside of the veggie area, we found out that our soil is almost all clay. I probably should have looked at that before starting anything at all, but I was really enthusiastic about the lasagna idea. Since clay is seriously lacking in organic matter and very difficult to work with, I’m glad I added went through this process despite some of the challenges. 3) Sometimes you just have to go buy materials, even if you don’t want to. The LeafGro has been invaluable. I could have never created that rich of a substance on my own and having something to plant straight into is useful. 4) Two layers of cardboard are probably unnecessary if you just do the first layer correctly. I think the second layer of cardboard blocked some of the decomposition that would have happened otherwise. But on the other hand, a few weeds still managed to get through. Chris pointed out that the first layer was pretty haphazard, with a lot of gaps. If I had made the first layer more consistent, I could probably eliminate the second one. 5) Keeping your neighbors happy is not the end all and be all, but it’s sure nice. I believe strongly in the power and importance of community. Having the police come by and tell me to clean things up was annoying, but probably not a bad thing in the long run. This entry was posted in food, gardening and tagged gardening, lasagna gardening, layer composting, permaculture. Bookmark the permalink. I dont know if you did so , but i got the impression from reading your story that you didnt soak the layers as you put them down , very important, things break down much faster with moisture, soak at first and then lightly every now and then…secondly, clay is not low in nutrients as you suggested it is actually quite high in nutrient, but inaccessible to plants because the particulate is so fine that it packs tightly together like rock almost, it merely needs to be broken up by fibrous additives hay peat compost manure sand stems etc…and if very alkaline, something slightly acid…like tea..to make the minerals more soluble and available to the plants. I have had good results with a similar method. I also discovered that it takes a bit more time to completely breakdown, but that doesn’t stop me from planting in the bed in the Spring. The results probably aren’t as good the first year, but it’s better than nothing (no sense in waiting for perfection). By the second Spring, it’s practically perfect.